A dry, gingery biscuit, round in shape, sublime in taste. "Just like I remember when I was a kid! Yes, they are that old!" "Enjoyed this biscuit immensely. 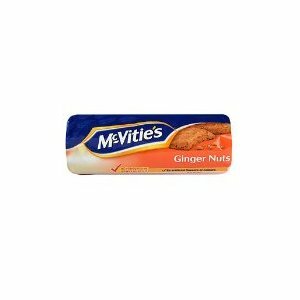 Great gingery, slightly bitter flavour. All round simple, great biscuit." "Very dunkable with a great taste." "Ever so slightly burnt round the outside but all in all a crisp, gingery, comforting classic on a cold winter's day. Always a winner!" "A classic biscuit - and in the land of ginger a masterpiece." "A classic biscuit but still a joy to behold.Crunchy, gingery biscuit bliss." "The 'extra ginger' claim on the packet was noticeable. A good all-rounder." One of the few available readily across the pond and for good reason these are delightful and inexpensive. A classic.